Here's an update on Carter from the couch. I decided to keep him home again today because last night before bed he said his ear really hurt. 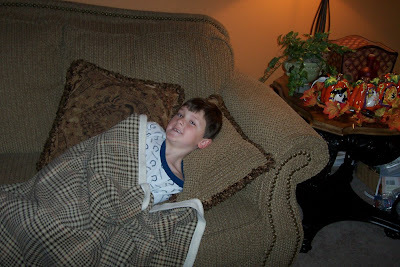 He came out of his bathroom saying he thinks his medicine is dripping from his ear (from this afternoon I thought?)... I look at him and it's blood! Running out of his ear! Ack! So I try to get the panic off my face, catch it with a tissue and tell him to finish getting his pajamas on and meet me downstairs. This gave me enough time to contact his Dr. and ask if this is normal to have blood coming out of his ear after an ear infection diagnosis. Thankfully, it is sometimes, but not without consequences. He has a ruptured eardrum. The pressure from the infection caused that, but the relief came pretty quickly for him. We need to keep water out of it and not put any numbing drops in. Supposedly, it's supposed to heal on it's own. One side effect is that he is temporarily hard of hearing in that ear. So I have to endure the constant "huh? ", "what Mommy? ", "huh?". I won't visit the worst-case scenario sites on the internet just yet though. Ok, who are we kidding - of course I already visited those worst-case scenario websites of a ruptured eardrum! I should have my medical degree from the school of Google. We'll all just have to be patient. He woke up this morning with some blood on his pillow and it started to drain "stuff" again a little while ago. He says it hurts when he presses on it. I told him how to make the pain stop - don't press on it! Grrrrrr, kids. But, he's doing well despite his pain. He washed down his breakfast cocktail of Amoxicillin and Motrin like a trooper. Amazing what a couple of hours of pain reliever will do to a child. I've had to tell him, oh about 100 times already to quit jumping around and stop coughing on his sister. I may need to strap him to the couch until it wears off. But it's an 8 hour dose so it will be a while. You can tell he's better by the grin on his face when I took his picture this morning. Take notice he's got on his lucky Colts pajamas. 54 hours and counting until kickoff. **For those unfamiliar with 'how stuff works' on a blog, you can click on the pictures to view them larger, and you can also click on the bold underlined words for more info. Remember to hit your "back" button to return to the original blog page**. So here's what else I woke up to this morning. This child is ALWAYS smiling. 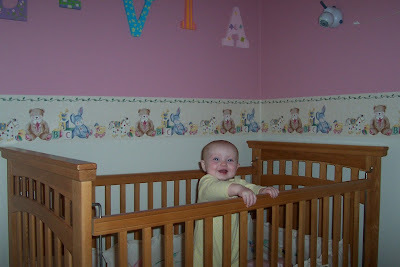 How could you resist that cute little face and those bright eyes saying, "Good morning world! Come to me!". I've decided I'm going to try and take a couple pictures to post each day with my daily log here. This one was obviously too cute to pass up. I usually hear her on the monitior 'talking' to her stuffed animals. I start walking down the hallway saying "Ooooliviaaaa wheeeeere aaaaare youuu?" and then she immediately pulls herself to a stand to greet me and I tell her, "Good morning, sunshine!" I open her blinds and off we head downstairs to start the day. Most days I'm able to get up with Carter and get him on the bus before she even wakes up. It's nice to get a little 1-on-1 time with him before school. But today he got to greet her with me - he's so cute the way he talks to her too. He calls her "my baby" and "sweet girl". I love it. Ok, so now I'll let you into our world of Halloween preparations! My parents and I started an annual tradition when they moved out here 7 yrs ago, of carving pumpkins on the 30th for display on Halloween night. I have them over for dinner, usually chilli but this year I made tacos. 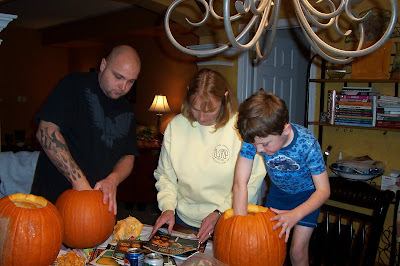 Then after dinner, we set up the kitchen to prepare for our carving adventures. Mom supplies all the different pattern books and carving tools, and I get the pumpkins for us. We all dislike the scraping out of the 'guts' inside so it's pretty funny to see how quickly we all want that part over and get washed up. This year, my brother PJ joined us and carved one too. It was his first time and he did a really cool skeleton design. It was pretty advanced for a first timer with all it's intricate cut-out spots. It was a fun evening and one that we all look forward to every fall. I can't believe I didn't get more shots of the family carving! This one will have tell the story! Here's the final result! 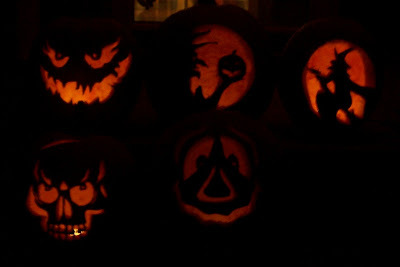 From top L-R the carvers were Carter and I did the scary face, Tom did the witch profile holding the pumpkin, Mom did the witch on a broom, PJ did the skull and Dad did the goofy face. It's always cool to see how the patterns transform into these sculptures. They look their best once darkness falls and the candle inside makes them glow. We all went outside to admire our hard work when the last pumpkin was finished. 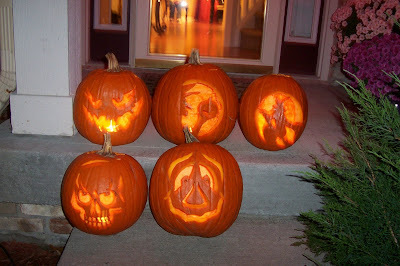 We scattered them around the front landscape to display on Halloween night. They were a hit! On Halloween, Grandma and Grandpa stopped by to see the kids in their costumes before the festivities began. They came bearing favorite treats - a cute halloween cellophane bag full of candy corn & plain mini-chocolate bars for Carter, and a cellophane bag full of Gerber Star puffs (apple cinnamon flavor!) for Olivia. They both loved it! Trick or treating was from 6-9 in our town and the doorbell began to ring right on the 6 o'clock dot! This has been my costume for the past 2 years. I used to be a the wicked witch mask from OZ, but decided to change to something else for a while. 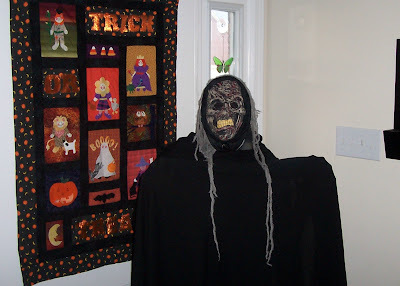 This year, instead of answering the door in this costume, I stood still on my front porch near the door. The kids couldn't tell if I was real or a statue. It was so much fun scaring them when they got closer - that's how I like Halloween! Tom took Carter around the 'hood and returned back in just an hour. Carter had filled up his pumpkin and declared he was ready to go home and sort. And eat. So they did their ritual of dumping out the candy and choosing which piece of sugar was going to be the first to touch his just-had-his-teeth-cleaned-the-day-before-halloween mouth. I'm sure it was something ooey and gooey and sticky. 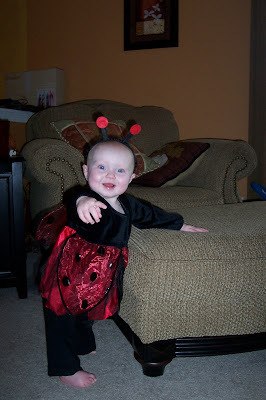 Here's Olivia the Ladybug just looking cute. We did not take her around because the neighbors all trick or treated at our house and got to see her anyway. And she has a pretty good cold right now, so keeping her in was the better decision. Isn't she too cute though? 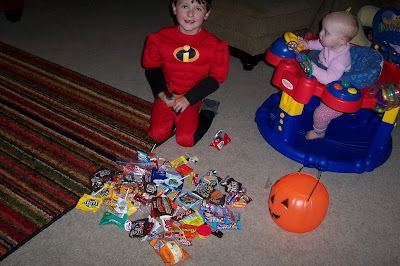 And of course, a picture with his loot! I've adopted my sister-in-law's way of how to handle the candy eating. Eat 'til you puke, kids! This eliminates the begging, hounding, whining and sneaking of said candy. I pretty much allow him to eat as much candy, and whenever so that A) it is gone much faster, and B) he gets sick of it in a hurry. Not feeling 100% the past couple of days has slowed down this process. But it's starting to kick into gear now. He's already had 3 pkgs of snack sized M&Ms, 5 rolls of Smarties, a Tootsie Pop and some candy corn. It's 10:30 in the morning. I thought it was the Motrin kicking in - on second thought, I might be on to something. But don't worry, he had breakfast...remember? That's too much to read. Later. . .